Brand new detached chalets (12) in Vaujany giving direct access to Alpe d’Huez ski area Le Grand Domaine located next to lifts (3 minutes walk). It is rare to find in this price range (4,800-5,100 euros per sqm including VAT) fully-detached chalets in a high altitude ski resort close to lifts for easy access to high altitude ski domain, we feel that Les Chalets des Etoiles in Vaujany is a good investment opportunity for anyone looking for high altitude skiing, a dual season location and the chalet lifestyle. Brand new detached chalets (12) in Vaujany giving direct access to Alpe d’Huez ski area Le Grand Domaine located next to lifts (3 minutes walk). It is rare to find in this price range (4,800-5,100 euros per sqm including VAT) fully-detached chalets in a high altitude ski resort close to lifts for easy access to high altitude ski domain, we feel that Les Chalets des Etoiles in Vaujany is a good investment opportunity for anyone looking for high altitude skiing, a dual season location and the chalet lifestyle. 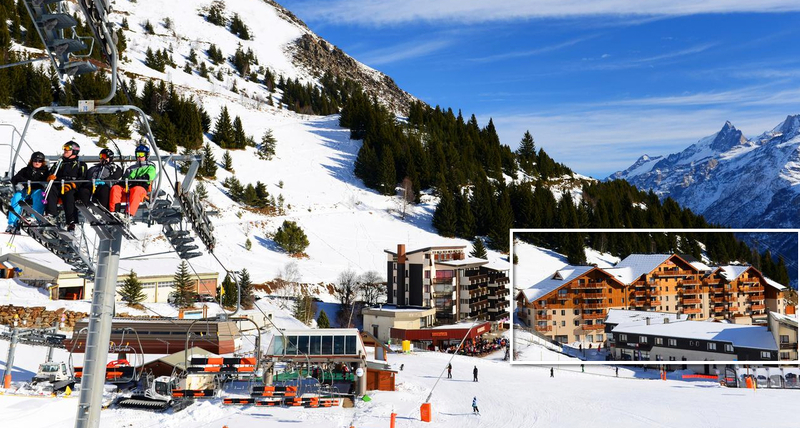 The Chalets des Etoiles are also strategically situated next to the sport and leisure centre which includes a swimming pool, sauna, hammam, Spa, gym, an ice rink, bowling and also next to the children and nursery club if you have children. These are traditional wood and stone chalets for that typical Alpine look and they are fitted with high-end fixtures like electric shutters, large choice of wooden or vinyl floors, tiles, bathrooms with towel racks fully-equipped, spacious private terrace with electric outlet and light as well as extensive closed garages. These chalets interiors can be modified as they are sold off-plan for example reducing the number of bedrooms to privilege space and living room/kitchen area for example. -Underfloor heating, fully-equipped kitchen (not included in price), large 60x60cm square floor tiles, wide hardwood parquet floor, floor to ceiling tiled bathrooms & WC, extra wood-cladding in bedrooms or living room ceiling. We can assist you with a low interest-rate French mortgage up to 80-90 per cent of the property price, contact us at FindHomeAbroad for more info on Les Chalets des Etoiles in Vaujany. Legal fees are reduced (expect around 2 per cent of property price for stamp duty and legal fees). Top location 3 minutes walk from lifts. You have exit next to chalet 12 onto road above plot, then 20 metres to escalator which takes you straight to cable car lift station. Vaujany is a traditional mountain village with its wood and stone chalets its small streets, fountains, farms and church. Located in isere and facing the majestic Grandes Rousses mountain range, Vaujany has kept its identity and mountain traditions yet the different infrastructures linked to the winter and summer activities are very modern. You will enjoy the almost endless amount of activities wether in winter or summer all set in this grandiose scenery. It also offers 250kms of Alpine skiing (high altitude up to 3,300m) as well as many tracks for hiking, cross country skiing as well as snowshoeing and more. Summer activities are many not to mention the famous Tour de France in Alp d’Huez. The Vaujany Ski area is an integral part of a massive domain covering 8 villages: Alpe d’Huez , Auris, Clavans, Le Freney d’Oisans, La Garde, Oz en Oisans, Villard Reculas and Vaujany.